Fairy tales are for children. Or not. I’m pretty sure I never imagined Hansel and Gretel the way they were portrayed in a recent film. If you’ve read the Grimm brother’s tales, you know a dark side exists. Fingers and toes being hacked off. Blood and gore. Not happy bedtime story material. Not that I’ve read a ton of them, but I haven’t been too impressed by the books based on these tried and true tales made famous (and sappy) by Disney. After all, isn’t an author supposed to think up their own story line? Enter The Lunar Chronicles by Marissa Meyer. I put off reading them for a couple years even though my students rated them as engaging. “You would like this, Mrs. Hughson.” Sometimes those kids are right. Not the tried and true Cinderella story here. I never imagined Cinderella as a cyborg. I don’t think even the Brothers Grimm could have come up with that one. Of course, that makes her less than human according to society. She’s even bought into the lie. She has no rights but to serve her wicked stepmother (not really even that- just a legal guardian). There is a handsome prince. There is a ball. Even the promise of marriage hangs over the story. But not in any way similar to the original fairy tale. All of it fresh and new with a dash of fantasy and a boatload of science fiction. Yes, there are aliens and spaceships. The series is named The Lunar Chronicles for a reason. And “don’t call it magic because it empowers them” gives you a hint about the mysticism involved. I was happy I had checked out the first and second book. 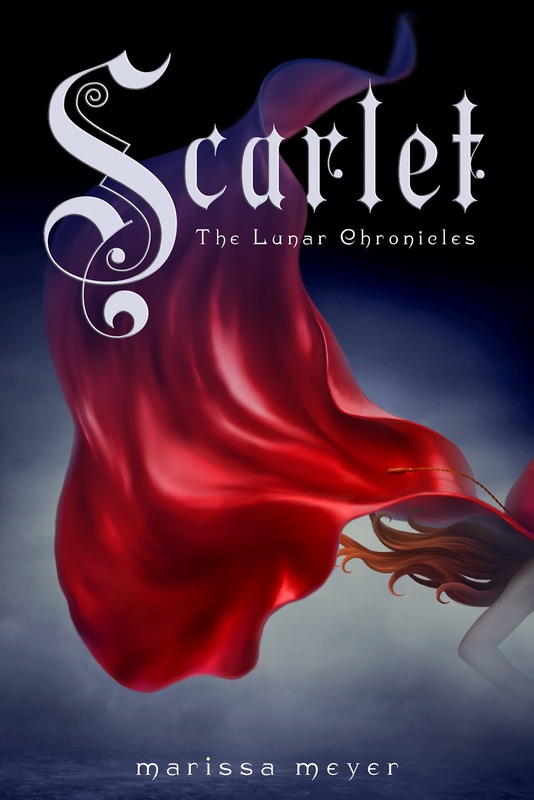 Last page read in Cinder led directly to opening the cover and reading the first page of Scarlet. Once again, this isn’t the Little Red Riding Hood story your mother told you to scare you away from talking to strangers. Unless the wolf was really a mutant alien. Maybe the grandmother in your tale was former military with a secret that’s about to threaten her life? Yeah, I didn’t think so. Scarlet wears her red hooded sweatshirt all the time. She hates that people think her grandmother’s crazy and is beyond irritated when the police decide she just ran off. Scarlet knows someone has kidnapped Grandma. Enter the Wolf and an alliance that leads to much more than either Scarlet or the mutant alien could have imagined. Fight scenes, romance scenes, chase scenes and the revealing of a diabolic plot designed by the Lunars. The story switches between what is happening with Cinder and Scarlet’s quest in a nearly seamless timeline. The reader knows they’ll meet up in the end. And they do, but that isn’t what anyone expects either. I wanted the next installment but it was spring break and the librarian was on vacation. 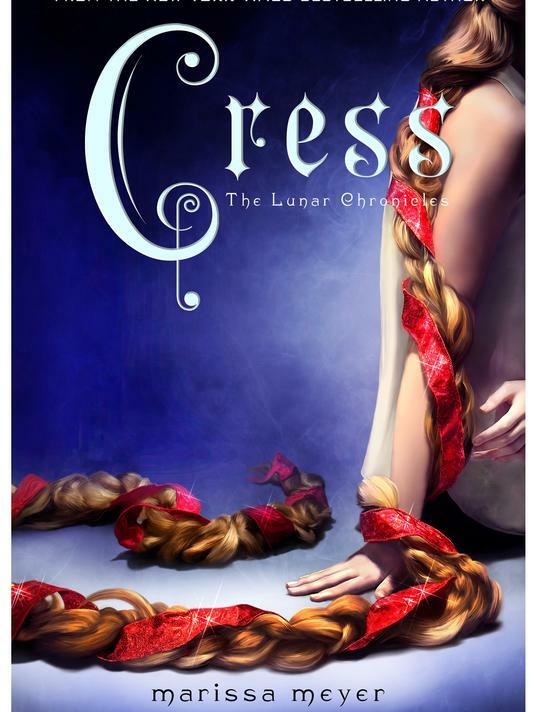 I had to wait before reading Cress. Or in this case, Crescent, Crescent, your satellite is going to fall out of the sky. And her long hair will wind her up tight with the Prince Charming sent to rescue her. This girl stranded and nearly forgotten in a satellite seemed the most vulnerable of the three heroines. She’s a programming genius and has been spying for the Lunar Queen for seven long years. No outside contact with anyone but the cruel woman who locked her away in the first place. As before, Meyer weaves the stories of the other characters in seamless timelines along with Cress’ discovery of Earth and love. For those who think Carswell Thorne is a crack up (I laugh almost every time he opens his mouth), you’ll be happy to see him as the object of Cress’ desire. My favorite part: Cinder finally gets her kiss from her Prince (now King Kai). Things get rough for Scarlet. People we’ve come to know and love (or hate) die in this book. You can’t have a violent manhunt without someone paying the ultimate price. I’m eagerly awaiting the next installment – Winter. We get to meet the little princess at the end of Cress. I think it’s going to be a Snow White story unlike any we’ve ever imagined. Five stars across the board for this series. Find it. Read it. You won’t be sorry. Any readers of this series checking out this post? What did you think of the books?